You've Gotta Try this! 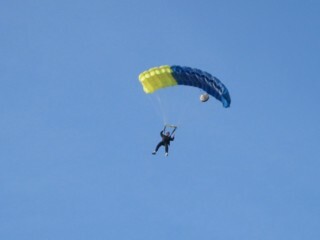 Adventure Sports community for Skydiving, Scuba, Rafting, Climbing, and Flying. Gotta try Skydiving! Gotta try Scuba Diving! Gotta try Shark Diving! Gotta try Rafting! Gotta try climbing! Gotta try Flying! You’ve heard the advice, “Live every day, like it was your last.” Well this site is dedicated to all those who take that quote to heart. We all have those things that we dream of trying, but push off for one reason or another. Maybe we fear the unknown, or think we can’t afford it, or don’t even know where to go to get started on something new. Well, its time to stop the excuses! You've gotta try it, and we can show you how. First, check out the interests above. Each link will provide you with general start-up information for each activity. Once you have chosen your adventure, click on Gotta Try Near Me for the locations in your area. This site is about YOU! You'll see that all the photo's on the site are submitted by our members. Please share your pictures with us! You've Gotta Read This! This page is full of articles chosen by our community members, and are constantly updated and re-ranked based on your votes. These articles are a great resource for information on Safety, Training, Equipment, News, and just some Cool Reads about the activities we all enjoy. This site is BRAND NEW, so we'll be updating it often to increase and improve our content.